Visitors have accessed this post 19797 times. This tutorial is part of Database Programming Made Easy Series. 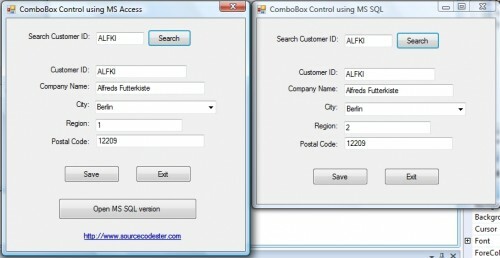 With few modification from the previous tutorial you will learn how to fill combo box with data. I am using Datasets and Data Adapters to connect to our database. I'm a newbie in VB.NET and i want to learn coding. Can you plz send me a VB.NET Maintenance Management and Stock system? Can any one help me creating our own control for combobox with checkbox dropdown in C#.net 2005. Ur answers r more helpful 4 me. Requirement is URGENT!!! i need samlpe code. the button is enable and disable depends upon value of the (ms-access)database field..
May restaurantsystem is a good example of a simple program. Download it and study the code. sir plz givem e a project name student information system. sir i need a institute management system for the prectice on design & database managment. Sir can you give me a simple payroll system? Im a newbie here in vb08 plss teach me how to make a simple visual basic payroll system thx!! re: Sir can you give me a simple payroll system? May payroll system is a good example of a simple program. Download it and study the code.